What’s hot and worth doing at the Kalaghoda fest? This year marks the 20th year of India’s largest & most iconic art fair. Over the years the number of people has just been increasing. Here is a quick guide on what to enjoy at the fair over weekend. Art Installations : there are over 10 of them , but here are the unique ones. Mother Earth with its core elements of fire, wood, water, metal and air depicted through the scooters. This wheel depicts, time since the festival was started. All the efforts that were put and over the years how more effort is being put. I totally love the colourpop. 20 years of celebrating the festival. It’s very relevant to what is happening. Artists gathering together, and putting in tons of effort. To showcase splendour to public, over the years. Whilst, there are great installations to watch, there’s also art and literature people can create. This beautiful lamp creation workshop, where the public, spend 90 minutes to design their own lamp. It should have some kinda special meaning for them. There are 90 different topical subjects, given as books. As an individual you could choose any number of subjects , that you want to leave your opinion on as many topics that you will like to. After few months, all 90 topics will be combined together to publish a book, which will have name of contributors. 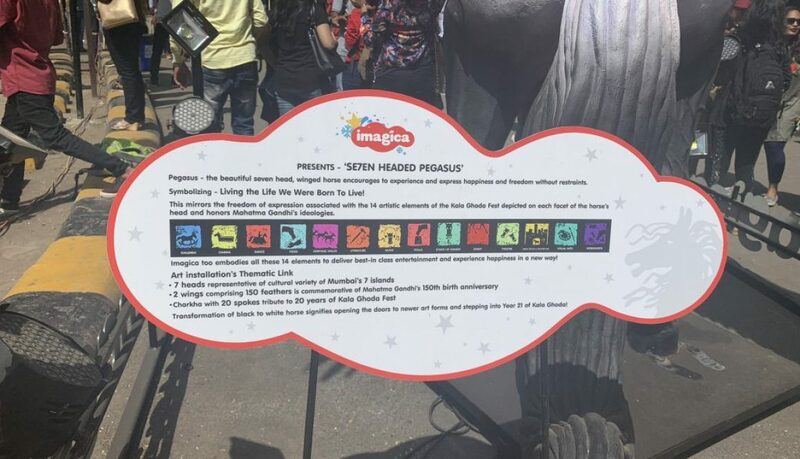 Another really interesting thing to do at the fair is take a foot massage for 15 minutes, from a blind volunteer of the Victoria Memorial School for the Blind. It only costs 100 Rs and is a wonderful means of earning for the blind. What to shop at Kalaghoda ? The festival is known for unique decor, clothes, accessories. It is a great platform for budding entrepreneurs. thenandnow: Fantastic decor and furniture hand painted in a series of colours by tribal artists. I am definitely going online and ordering some for my home. Zubiya: very cool footwear. Check these out. Shopping is subjective, so check it all out. Food: No festival is complete without food. All restaurants in Kalaghoda area put up their stalls. Grab a grub at Chetna snacks, to get a flavour of Mumbai, and then for the sweet head over to Nutcracker to have their pancake or 7 layer cookie. This Sunday, the singer Shaan is playing at Asiatic Steps ! The land of ‘Thunder Dragons’ or ‘Druk Yul’ had been on our minds for the longest time. Most of us have heard about Bhutan’s GNH (Gross National Happiness) and how it’s been called a ‘Happy Nation’. Trust us; there is more to that country: their awe-inspiring architecture, magnificent mountains, soothing air, friendly people, reverence for the King & Queen, amongst many others. The more we read about this Himalayan Jewel, the more we wanted to go and see it for ourselves. 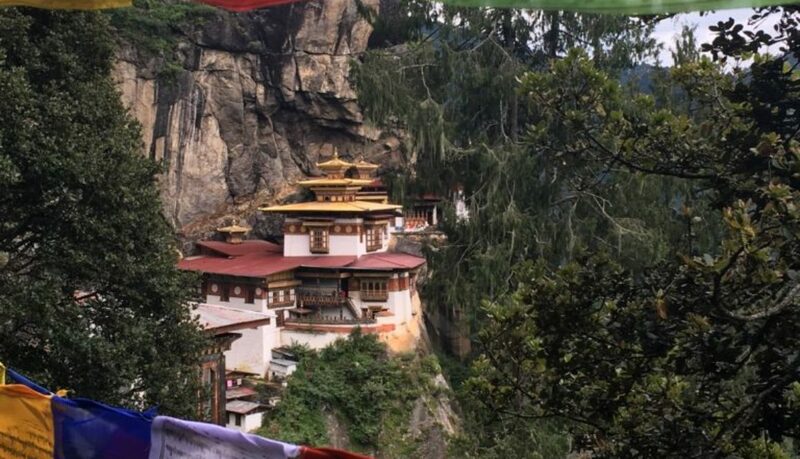 Tiger’s Nest or Paro Taktsang monastery in Paro is by far the most iconic symbol of Bhutan. Legend has it that Guru Rinpoche arrived here on the back of a tigress and meditated at this monastery. Hence the name – ‘Tiger’s Nest’. The trek takes about 6 hours which includes the tour of the monastery. The trail is uphill but not very steep, pretty doable we must say. It is tiring yes, gives you a serious fitness check (if you don’t believe in any form of exercise, like us!) but believe us, once you reach the top and inhale the pure and serene air, you will forget the aching bones and the gasping you experienced. The scenery over the valley is just mind blowing – completely lined with prayer flags and prayer wheels. Pro tip – Your ticket entitles you to a guided tour of the monastery and you don’t really need a guide for the trek. Avoid using the horse service. It looks very scary and of course spare the poor thing! Paro Tshechue/Paro Festival which happens in the month of April at the Rinpung Dzong is a series of dance performances by the monks and laymen wearing ornate costumes and masks. It is said that one gains merit by attending these festivals. (WooHoo! Brownie points for being a part of this) We woke up at 3am (we surprise ourselves by doing things like these :p ) to witness the Thongdrel festival – which is an unfurling of a massive embroidered painting of Guru Rinpoche. It is considered so sacred that simply seeing a Thongdrel unfurl is said to cleanse one’s sins! National Institute for Zorig Chusum in Thimpu is a must visit! It’s a government initiative to preserve local art and craft. It offers courses on Bhutan’s 13 traditional arts which includes calligraphy, painting, sculpture, wood carving, casting, pottery, embroidery, tailoring, weaving, masonry, silver and gold smith workshops. The discipline and skills that the students exhibit is extremely impressive! Buddha Dordenma located in Thimpu city is a gigantic 51 meter Buddha statue which houses 12,500 smaller Buddha statues in it. Do Chula Pass is a picturesque mountain pass in the snow covered Himalayas on the way to Punakha from Thimphu. It has 108 memorial stupas built in the honour of Bhutanese soldiers who were killed in war with Assamese insurgents. The three day Rhododendron Festival at the Royal Botanical Park in Lamperi aims to create a platform for eco-tourism. Bhutan is home to about 46 species of Rhododendrons. The majestic Punakha Dzong situated at the junction of PoChu and MoChu rivers served as both religious and administrative centres of Bhutan. House of Juliet: Punakha had a real version of Romeo (Singye) and Juliet (Galem) from the 14th century. It’s a touching love story of two ordinary people and their extraordinary love for each other, who reunited after death. This historically built house which is in ruins now, belongs to Galem (Juliet). News has it that it is getting converted into a museum of love! 1. Beat the cold with a hot mug of Butter tea. You have to taste it to know what it is! 2. Savour the national dish of Bhutan, Ema Datshi – a delicious stew of chillies and yak cheese. 8. Observe traffic police in Thimphu. There are no signals, so the policemen constantly are moving their hands,to manage traffic. It’s a sight worth watching.They do a brilliant job, and the traffic is well controlled. 9. Take an hour of your time and visit Thimphu post office. The picture below tells you exactly what you can do. 10. Visit Chimi Lkakhang in Punakha and observe the houses. We used Norbu Bhutan Travel Pvt. Ltd. The guide and driver were extremely friendly and accommodative. Planning your Bhutan trip? Have some queries? Shoot them in the comments section right away!